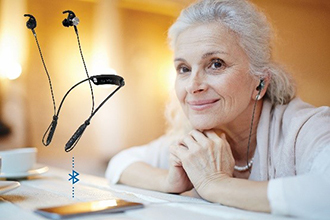 BeHear® NOW is a Bluetooth® stereo headset with customizable assistive hearing capabilities. It leverages HearPhones™, a licensable technology from Alango Technologies, Ltd., to amplify and clarify speech, streamed audio, live music, and sounds from nature. With BeHear NOW everyone - even those with mild to moderate hearing loss - can enjoy a completely personalized listening and hearing experience. Important ambient sounds, peoples’ voices, and sounds from all audio sources are amplified, enhanced and adapted to suit individual hearing preferences and capabilities. For more information about BeHear NOW and other assistive hearing products in Alango’s Wear & Hear line, visit www.WearAndHear.com.